Director of Veritas Swordplay Academy, Eric Slyter has been researching medieval and renaissance arms and armour actively since 1993. He worked in the Pacific Northwest renaissance faire circuit from 1996-2001 as a performer, director and instructor. Eric has been studying Historical European Martial Arts (HEMA) since 2002, with his primary track of study being the medieval arts of the German master Johannes Liechtenauer. He was a student of noted researcher and author Christian H. Tobler, and has trained in traditional medieval German weapons such as longsword, pole axe, dagger, hand-to-hand combat, spear, sword & buckler and messer. Eric has also studied Italian rapier, Scottish broadsword and a variety of other HEMA. In 2007, Eric became one of the first HEMA instructors to be invited to teach in Mexico. He has instructed at classes and workshops at his organiztion's own Veritas Medieval Faire (Ellensburg, WA), in addition to Ye Merrie Greenwood Renaissance Faire (Kennewick, WA), RadCon (TriCities, WA), SpoCon (Spokane, WA), MisCon (Missoula, MT), Bend Oktoberfest (Bend, OR), Tacoma Maritime Fest (Tacoma, WA), Spokane Highland Games (Spokane, WA), Wenatchee Renaissance Faire (Wenatchee, WA) and Tacoma Highland Games (Tacoma, WA) among numerous other events, and continues to teach classes and workshops locally and throughout the region on a regular basis. Eric also runs the Fencing for Fun modern fencing program for those who are looking for a different outlet than German medieval martial arts. 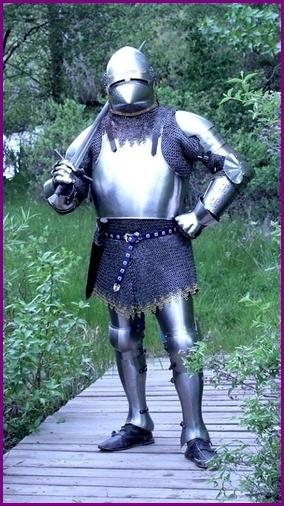 Eric brings this expertise of arms, armour, knighthood, chivalry and combat to the public with Knights of Veritas educational presentations for schools, libraries, museums and other partners.